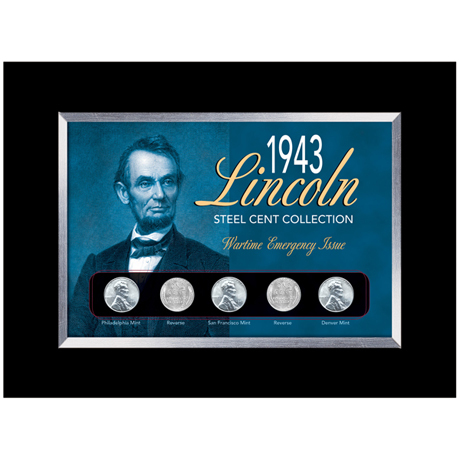 Issued for just one year at the height of World War II, the 1943 Lincoln steel cent freed up precious copper for America's war effort. It was made from low grade carbon steel, with a zinc coating deposited electrolytically to prevent rusting. You'll own five of these unique coins in our handsome collection. It includes one from the Philadelphia mint, without mint mark... one each from the Denver and San Francisco mints with mint marks... and two views of the Wheat reverse. All are mounted under clear polymer in a black-finished wood frame with easel back. Certificate of authenticity included. Allow 2-3 weeks, no rush delivery or gift box. Item can only be shipped within the Continental US.